Christopher Jon Weinke (born July 31, 1972) is an American football coach and former player who is the quarterbacks coach for the Los Angeles Rams of the National Football League (NFL). Weinke is a former professional American football and baseball player. After spending six years in the Toronto Blue Jays minor league baseball system, he enrolled at Florida State University at the age of 26, and played quarterback for the Florida State Seminoles. He thereafter played professionally in the NFL, where he spent most of his career with the Carolina Panthers. Weinke played minor league baseball in the Toronto Blue Jays farm system from 1990 to 1996, advancing to class Triple-A, before deciding to attend Florida State University. Head coach Bobby Bowden had initially recruited Weinke when he was a prep quarterback in 1989 at Cretin-Derham Hall High School. After quitting baseball, Weinke called Bowden, and Bowden offered him a scholarship with 1997 recruiting class. After arriving he quickly distinguished himself as a starting quarterback, leading the team to victory in the 1999 National Championship. In 2000, at 28, he became the oldest person to receive the Heisman Trophy. He was drafted by the Carolina Panthers in the 2001 NFL Draft, where he served mostly as backup quarterback until being released in 2006. He then spent one season with the San Francisco 49ers before leaving the NFL after the 2007 season. Weinke was born and raised in St. Paul, Minnesota, where he attended Cretin-Derham Hall High School and was a three-sport star, playing first base for the baseball team, quarterback for the football team, and was captain of the hockey team. In 1989 during his senior year in high school, he was a Parade magazine and USA Today first team All-America selection, was named Minnesota's prep football player of the year, and was seen as the top senior quarterback in the country. Weinke was recruited by over 70 Division 1 schools, including Alabama, Arizona, Arizona State, Florida State, Illinois, Minnesota, Miami, Washington, and Wisconsin, but ultimately signed a national letter of intent and committed to play quarterback for the Florida State Seminoles of Florida State University despite being a diehard Miami Hurricanes fan (due to fellow Cretin-Derham Hall alumnus Steve Walsh attending the school and starring for the team at quarterback). However, he was also an all-state baseball player and was drafted in the 2nd Round of the 1990 Major League Baseball First-Year Player draft (the 62nd player taken overall) by the Toronto Blue Jays. After spending four days in August 1990 on the FSU campus, Weinke put his college career on hold and instead signed a contract to play professional baseball and reported to the Toronto Blue Jays minor league baseball system. Head football coach Bobby Bowden promised Weinke that he would always have a scholarship offer if he wished to return. 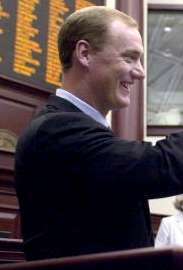 Weinke entered Florida State University in 1997, when he was 25 years old and joined the Florida State Seminoles football team as a quarterback. As a sophomore in 1998, Weinke led the Florida State Seminoles to a 9–1 record and #2 national ranking before a season-ending neck injury by Patrick Kerney in the Virginia game forced him to the sidelines for the rest of the season. During his junior season in 1999, he led the #1-ranked Seminoles to the school's first undefeated season and second national championship, defeating Michael Vick and the Virginia Tech Hokies, 46–29. As a senior in 2000, Weinke led the nation in passing with 4,167 yards and won the Heisman Trophy, awarded to college football's best player, as well as the Davey O'Brien Award and the Johnny Unitas Award. He also led the Seminoles to the Orange Bowl for their third national championship game in as many years, where they lost 13–2 to the Oklahoma Sooners. At the age of 28, Weinke was the oldest player ever to win the Heisman Trophy. He finished his Florida State career with a 32–3 record and held numerous FSU records including most passing yards in a career and most career touchdown passes. In 2001, Weinke became the seventh Seminole (and second quarterback) to have his jersey retired. He also graduated with a degree in Sports Management and was a two-time ACC All-Academic Team selection. Weinke was originally recruited by Florida State as part of the same recruiting class as Charlie Ward, another quarterback who also won a Heisman Trophy and led the Seminoles to a national championship. However, because of Weinke's long hiatus in baseball, Weinke and Ward were never teammates. Weinke was selected by the Carolina Panthers in the fourth round (106th overall pick) of the 2001 NFL Draft. In 2001, he was the starter when the Panthers finished with a 1-15 record. At the time, the Panthers' 15 consecutive losses in 2001 was a single season record. Weinke averaged 36 pass attempts per game, more than any rookie in NFL history up to that point. After the season, Weinke became the Panthers backup quarterback. He saw his first action since the 2002 season on October 16, 2005, when starter Jake Delhomme went down with an injury against the Detroit Lions. Weinke threw a touchdown pass to wide receiver Ricky Proehl, giving the Panthers the 21–20 win over the Lions. He re-signed with Carolina during the 2006 off-season, where he continued to back up Delhomme. On December 10, 2006 in a game against the New York Giants, Weinke made his first start since 2001 in place of an injured Delhomme. The Panthers lost the game, but Weinke threw for 423 yards, topping the previous single-game team record of 373 set by Steve Beuerlein. Weinke started the next two games against the Pittsburgh Steelers and Atlanta Falcons, with the game against Atlanta being his second (and last) win as a starter in the NFL. As a starting QB for the Panthers, Weinke's team lost 17 consecutive games that he started (14 in 2001, 1 in 2001 and 2 in 2006). After retirement, Weinke and his family lived in Austin, Texas, where he worked as a vice-president in marketing and event-planning for Triton Financial. In 2010, Weinke teamed with Pro Football Hall of Fame coach John Madden and became the director of the IMG Madden Football Academy in Bradenton, Florida. The Academy offers a comprehensive football training program that emphasizes teaching the fundamental techniques of the game. In 2011, Weinke worked with the Carolina Panthers' number one draft pick Cam Newton at IMG up to two hours a day during the NFL lockout. On February 19, 2015, it was announced that Weinke had been hired as Quarterbacks Coach of the Los Angeles Rams. 1 2 3 16 Chris Weinke (1972-07-31). "Chris Weinke Profile - Florida State University Official Athletic Site". Seminoles.com. Archived from the original on November 23, 1999. Retrieved 2012-09-10. ↑ "1990 Major League Baseball Draft Pick Transactions". Prosportstransactions.com. 1990-11-20. Retrieved 2012-09-10. ↑ "Chris Weinke News - The New York Times - Narrowed by 'TORONTO BLUE JAYS'". The New York Times. 1 2 "2009 ACC Football Legends: Chris Weinke, Florida State - The Official Athletic Site of the Atlantic Coast Conference". Theacc.com. 2009-10-06. Retrieved 2012-09-10. ↑ "Winners". Heisman.com. Archived from the original on 2013-10-05. Retrieved 2012-09-10. ↑ Archived March 27, 2010, at the Wayback Machine. ↑ "Cam Newton working daily with Chris Weinke | ProFootballTalk". Profootballtalk.nbcsports.com. Retrieved 2012-09-10. ↑ "Rams hire former Heisman winner Chris Weinke as QBs coach". sportingnews.com/. Retrieved 2015-02-23.